'That's a very bad idea,' said Christopher Hart of sending passengers trains to smoke. WASHINGTON (AP) — A fire that caused a Washington subway train to fill with smoke inside a downtown tunnel last year, killing one passenger and sickening dozens, can be traced to poor maintenance and ineffective inspection practices by the city’s beleaguered transit authority, federal investigators said Tuesday. The National Transportation Safety Board issued its final report on the January 2015 fire at a meeting on Tuesday, placing the blame on the Metro transit authority for failing to properly install and maintain third-rail power cables, causing them to become damaged by water and other contaminants. 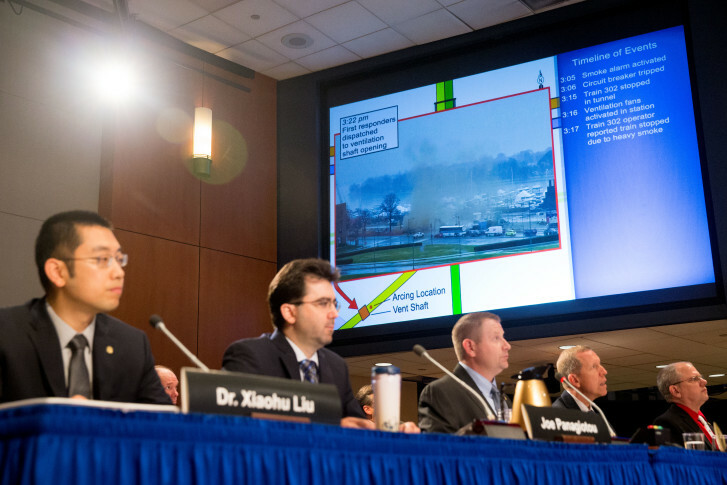 The NTSB also faulted Metro for a lack of smoke detectors in its tunnels, for ventilation fans that didn’t work properly and for not training its employees on how to use the fans. It also blamed the District of Columbia’s fire department and its 911 call center for delays in responding to the fire. Passengers waited on the smoke-filled train for more than 30 minutes before the first emergency responders arrived. NTSB Chairman Christopher Hart said Metro did not make meaningful safety improvements between a deadly collision in 2009 and the 2015 fire, and investigators said some of the system’s safety problems date back to its first fatal accident in 1982. The 2009 crash between two trains was the worst in Metro’s history, killing nine people. The board made several recommendations to Metro after that crash, but Hart said its warnings were not heeded. Most of the facts surrounding the 2015 accident had already been made public by the NTSB. One disturbing detail that emerged at Tuesday’s meeting, however, was that Metro lacked any way to pinpoint the location of smoke or fire in the system’s tunnels and that trains full of passengers were routinely sent into tunnels to figure out where smoke was coming from. That practice has been discontinued and trains are now offloaded before operators move them into tunnels with possible smoke or fire, Metro general manager Paul Wiedefeld said Tuesday. Joe Gordon, the lead NTSB investigator for the L’Enfant Plaza incident, says it appears Metro changed the practice sometime last year since it was handled correctly during a smoke incident near Friendship Heights on the Red Line in the months following the smoke near L’Enfant Plaza. “So there’s a success story there that the did change the procedure and get the passengers out of the train,” Gordon said. After the meeting, Hart said there was no evidence that the train in the 2015 accident was sent to investigate the source of smoke. Instead, he said, the operator continued into the tunnel despite the presence of smoke. Hart called that a “very bad idea” following the meeting. “Our point is to use a train with appropriately staffed people who can identify what the problem is and do the proper response,” Hart said. Metro’s standard operating procedures call for all trains to be stopped after a report of smoke, investigators said. But that wasn’t done, and the train was unable to back up into the L’Enfant Plaza station in part because another train was sitting on the platform behind it. Carol Glover, 61, a federal employee from Alexandria, Virginia, who was on her way home from work, died after being stranded on the smoke-filled train. Her sons have filed a lawsuit against Metro. In March, a similar fire that broke out before the system began carrying passengers for the day prompted Wiedefeld to shut down the entire system for more than 24 hours to conduct emergency inspections. Surveillance videos of that fire, in which large flashes could be seen inside a tunnel at the McPherson Square station near the White House, were made public during Tuesday’s meeting. Since the 2015 fire, the U.S. Department of Transportation has temporarily granted safety oversight of Metro to the Federal Transit Administration. Hart and other NTSB members criticized that move, saying that Metro should be overseen by the Federal Railroad Administration, which has stronger enforcement powers, including the ability to punish rail networks for violations. Placing Metro under the railroad agency’s oversight would require action by Congress. In a letter to Hart on Tuesday, Transportation Secretary Anthony Foxx argued that the transit agency was providing robust oversight and said it would not “advance the cause” to ask Congress to transfer that authority to the railroad agency.